The Seven Deadly Sins Season 4 will reunite the Sins for a blast from the past. 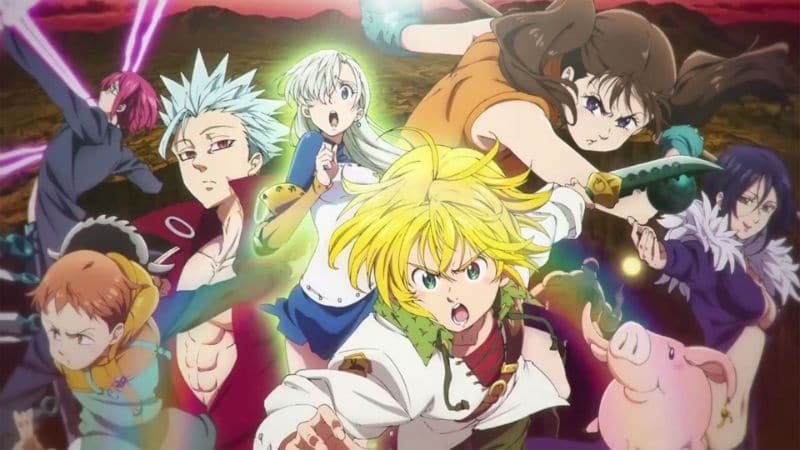 The release date for The Seven Deadly Sins Season 4 on Netflix U.S. is going to be a time looked forward to by all anime fans, especially now that the story is marching toward another epic war between the races. 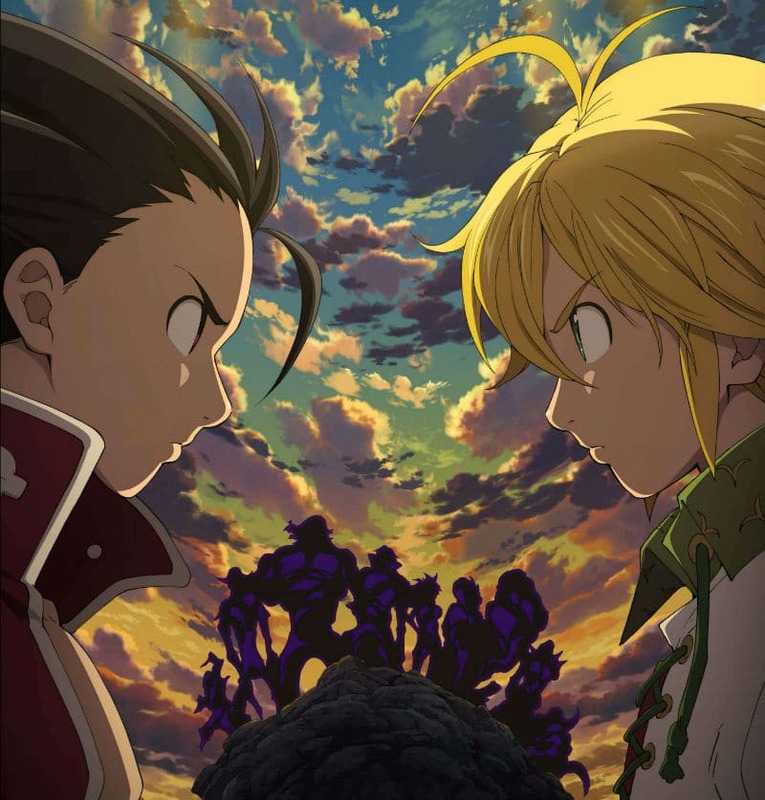 Considering that the third season was called Nanatsu no Taizai: Imashime no Fukkatsu (Revival Of The Commandments) in Japanese, Nanatsu no Taizai Season 3 (by Japanese season counting) is going to be called Kamigami no Gekirin (Wrath of the Gods). The big news is that the anime is switching studios from A-1 Pictures to a new staff at Studio DEEN. But that doesn’t mean the entire staff is new. Director Susumu Nishizawa (Reikenzan: Eichi e no Shikaku, Mobile Suit Gundam SEED C.E.73: Stargazer) is returning after doing storyboards on Revival Of The Commandments. Music composers Hiroyuki Sawano, Kohta Yamamoto, and Takafumi Wada are also returning. Story composition is being handled by Rintarou Ikeda and Rie Nishino is doing animation character setting. The major Japanese cast for The Seven Deadly Sins anime is also returning. What’s more, the fourth season is going to be setting up the story’s “climax”, which probably means The Seven Deadly Sins Season 5 could be the final season of the anime adaptation! The ending of the manga has been announced and that information has major ramifications for the future of the anime series. It’s possible that Nanatsu no Taizai Season 4 could potentially be called Nanatsu no Taizai: Atarashi seisen or Shin seisen (New Holy War). Back in 2012, Nanatsu no Taizai manga creator Nakaba Suzuki began serializing his story in Weekly Shonen Magazine. The mangaka has created multiple spin-off stories and released hundreds of chapters despite suffering from personal health problems. The franchise is among the top best-selling media franchises in Japan, beating even Star Wars in 2017, but it’s also become well-known internationally ever since the anime adaptation began streaming via Netflix. The Seven Deadly Sins manga in Japanese was up to Chapter 285 when the third season released on Netflix US. New chapters are released on a weekly basis. The chapters are published in tankobon hardcover format every two months and each book includes nine chapters. Volume 36 (which includes up to Chapter 302) was released on April 17, 2019. Volume 34 came bundled with a special OVA episode. The Seven Deadly Sins manga’s English translation by Kodansha Comics is not too far behind the Japanese language books. Volume 31 came out already on March 5, 2019, Volume 32 is scheduled for May 14, 2019, and Volume 33 for July 23, 2019. However, it’s much easier to catch up by reading the English translation on Crunchyroll, which comes out on a weekly basis right behind the release in Japan. 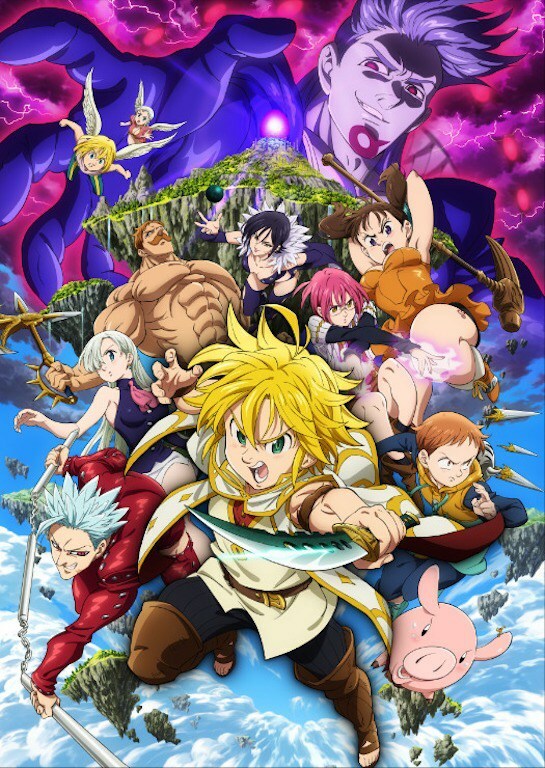 Before The Seven Deadly Sins Season 4 comes out, anime fans can go watch the fall 2018 movie The Seven Deadly Sins: Prisoners of the Sky (Gekijoban Nanatsu no Taizai Tenku no Torawarebito in Japanese). The release date for The Seven Deadly Sins movie by A-1 Pictures was August 18, 2018, and the full movie is already available on Netflix U.S. for English-only fans. This article provides everything that is known about The Seven Deadly Sins Season 4 and all related news. As such, this article will be updated over time with news, rumors, and analysis. Meanwhile, let’s delve down into what is known for certain. You may have noticed that this article refers to The Seven Deadly Sins Season 4 and Nanatsu no Taizai Season 3 interchangeably. This is because Netflix U.S. is counting the anime seasons differently from the Japanese releases. Therefore, for the purposes of this article, the season counting will be based on the Netflix standard. The first season of the anime series finished broadcasting in Japan back in 2015, but the first 24 episodes did not begin streaming internationally until months later. Unfortunately, Netflix Japan airs anime episodes the day they’re released, but Netflix U.S. sets up Americans for binge-watching entire seasons. Thankfully, Netflix has sped up the process considerably in recent years, but it’s still a frustrating waiting game for anime fans in the United States. Ironically, the official Netflix page for the anime declares that fans can “watch Season 3 now on Netflix,” but that’s not accurate at all. 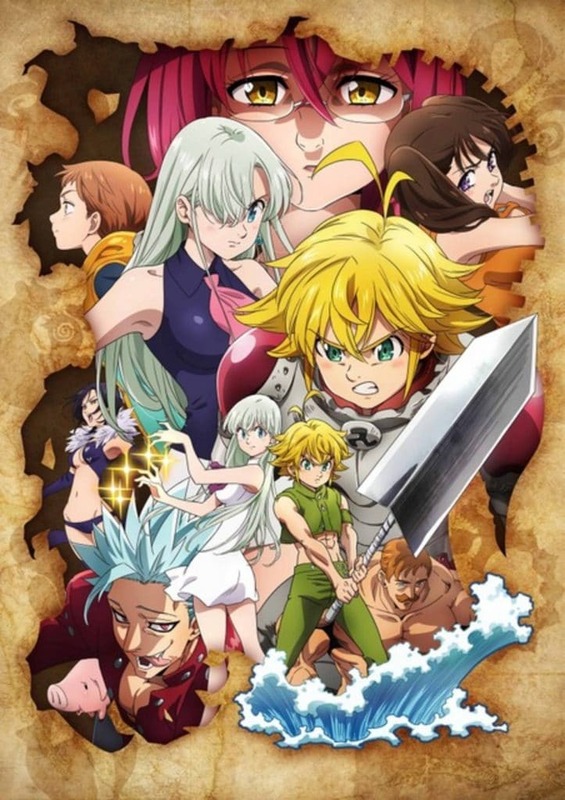 A four-episode Nanatsu no Taizai OVA (Original Video Animation) series released in 2016 called The Seven Deadly Sins: Signs Of Holy was mistakenly labeled as being the second season when it was first released on Netflix. The real second season, The Seven Deadly Sins: Revival of The Commandments, first began airing in Japan on January 13, 2018. There was a brief hiatus in broadcasting between the two cours, but Nanatsu no Taizai Season 2 Episode 24 released on June 30, 2018. Netflix U.S. eventually released French, Spanish, German, and English dub of The Seven Deadly Sins Season 3 on October 15, 2018. Netflix could have handled it like the Violet Evergarden anime, which began streaming in the United States the day the finale broadcasted in Japan. Instead, Netflix U.S. apparently delayed the release date for The Seven Deadly Sins Season 3 since the dubbing process takes several months. The Seven Deadly Sins Season 3 on Netflix U.S. introduced American anime fans to new demonic enemies called the Commandments. Of course, you probably already knew that since you’re reading this article. Similarly, the Netflix U.S. release date for The Seven Deadly Sins Season 4 is likely to be delayed by months based on the English dub. That would mean the premiere date will be some time in 2020. Note: This article will be updated once the exact The Seven Deadly Sins Season 4 release date on Netflix U.S. is announced. The ending of the first season of The Seven Deadly Sins anime showed the king’s festival and Elizabeth departing with the Sins to head to Camelot with King Arthur. 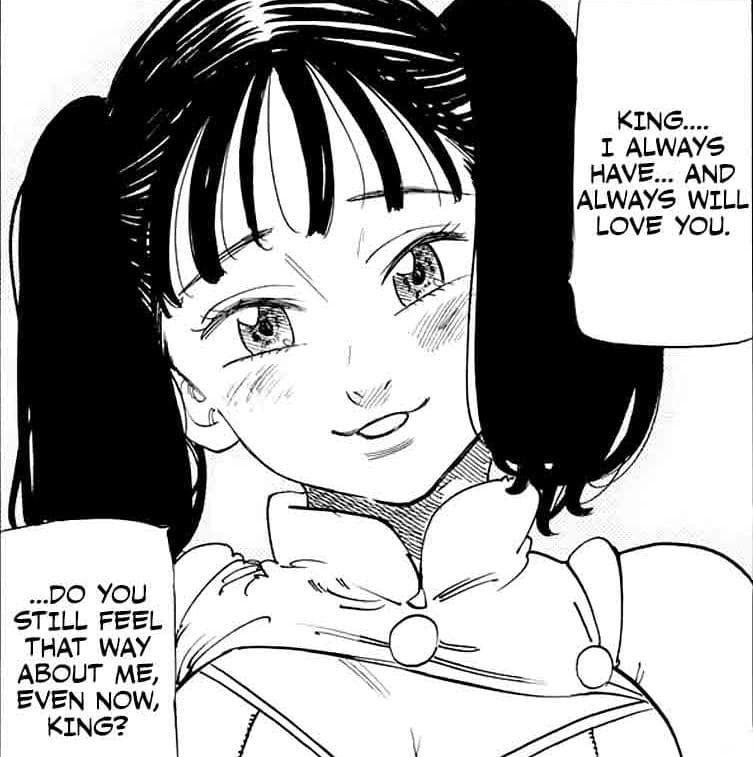 Technically, that never happened in the manga, so Revival of the Commandments retconned that ending by claiming that Elizabeth dreamed the whole thing up. The OVA episodes also provided extra character development that was not originally in the manga. However, from there the anime seemed to more closely follow the manga’s story. The first season ended in Chapter 100 of Volume 13, although Episode 24 did tease some of the developments which took place in Volume 14. All in all, the pacing of the first season was reasonable compared to most anime adaptations of manga, maintaining a chapter-to-episode ratio of about 4 to 1. The opening episodes of Season 3 slowed the pacing down a little, averaging a 3.5 to 1 ratio since the first cour finished off with the beginning pages of Chapter 143. Episode 13, “Farewell, Beloved Thief,” shares the same title as Chapter 146. The second cour had manga fans praising the sun since The Lion’s Sin of Pride, Lord Escanor, finally made his appearance in the anime (the muscular character’s manga debut occurred in Chapter 147). The pacing accelerated greatly during the second cour since Episode 20 ended with Chapter 179, which is the ending of Volume 22, and Episode 21’s ending corresponded to Chapter 183. Then The Seven Deadly Sins Season 3 Episode 24 ended right around 197 of Volume 24, which features the return of a hero as an Anti-Villain. That’s great news for those who want to read ahead of the anime since the English translation of the manga has already surpassed the third season’s ending. Warning: The following describes the final four episodes of Season 3. Skip to the next section to avoid spoilers. Meliodas and the Sins found themselves in quite the predicament near the end of the third season. The Ten Commandments surround Meliodas, who is revealed to be the former leader of the elite Demon group. Meliodas had betrayed all of them, killing two of the Commandments in his wake when he left. The Commandments blame Meliodas for starting the Holy War 3,000 years ago by tipping the balance of power. Estarossa, the Commandment of Love, set out to kill Meliodas by destroying all of his demon hearts, the only part of a demon’s body that won’t regenerate. Ban surprises the Commandment Melascula when she tries to consume Meliodas’ soul, stopping her cold with a head-twisting surprise attack and then ripped out all of her Demon hearts using Fox Hunt. But Estarossa ignores Ban’s attacks and forces him to watch as the Demon leader destroyed Meliodas’ seven hearts one by one. He then obliterates Ban for becoming too quarrelsome, but the unkillable Ban survives even that attack. The execution in Chapter 177/Episode 20 ends with Meliodas lying dead wrapped in the arms of a weeping Elizabeth. With the Sins’ leader dead, the Ten Commandments and the Demon Clan conquer Britannia easily. A month has passed and the frightened commoners are rising up to sacrifice strong human souls like the Holy Knights to the demons. Fraudrin kills Ruin and Friesia by taking their souls. King Arthur makes a stand against the demons. Eventually, the Commandments start laying siege to Liones castle. Fortunately, Ban has completely regenerated and he has rallied the Holy Knights in defense of their kingdom. Lord Escanor’s pride allows him to stand against Estarossa’s demonic powers since the Sin feels no anger or hatred toward his opponents, only pity towards those weaker than himself. And with the sunshine at its peak, Escanor certainly had reason to believe he’d win the fight. The fight only picks up further when Lady Merlin reveals herself as a master of magic and time itself. Meanwhile, Gil’s father, the former Holy Knights captain Zaratras, is miraculously revived from the dead. Elizabeth has been storing Meliodas body and it’s revealed that she tried visiting him at the Necropolis, the Capital of the Dead which was a place featured in the first season. But Meliodas was not there! Zaratras helps Elizabeth discover memories from both Meliodas and her past. It’s revealed that the princess knew Meliodas as a baby and that the Seven Deadly Sins were specifically commissioned years ago to destroy the Ten Commandments. It turns out that Meliodas was stuck inside Purgatory, not the Necropolis. And now the Demon King, Meliodas’ father, is feeding on his emotions to grow and to restore Meliodas to his former self. But by Chapter 188, Melodias makes a melodramatic entrance to save Elizabeth’s life and he arrives at Liones castle just in time to take the fight to the fully-revealed giant Fraudrin. The middle of Chapter 197 is the perfect stopping point for Revival of the Commandments since this ending follows the successful defense of Liones kingdom and Meliodas’ return. Camelot has become the demon’s stronghold and it’s time for the Sins to take the fight back to the Demon Clan in The Seven Deadly Sins Season 4. In August 2018, The Seven Deadly Sins manga creator Nakaba Suzuki gave an interview with Kadokawa’s Da Vinci Magazine where he discussed his plans for the future. He revealed that Nanatsu no Taizai’s ending will happen in “about a year,” or sometime in the late summer/early fall of 2019. From the beginning, the mangaka had hoped to finish the entire story by The Seven Deadly Sins Volume 40. However, that does not mean it’s the final ending to the entire series. 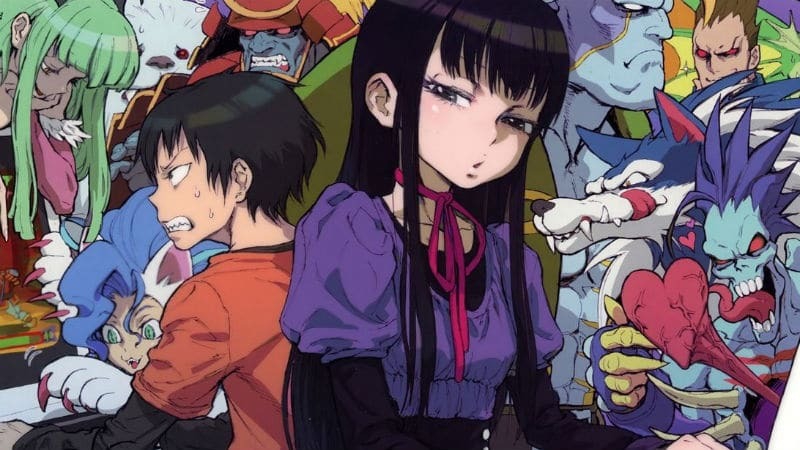 He’s open to producing a Nanatsu no Taizai sequel or perhaps a spin-off, although the decision is ultimately up to the editors of the Shonen magazine. At the same time, he’s also considered creating a baseball manga series. So, how many chapters does that translate into? Each manga volume comes with around eight to nine chapters (excluding extras). Therefore, Nanatsu no Taizai Volume 40 will finish off around Chapter 331 to Chapter 338. The key visual for The Seven Deadly Sins: Prisoners of the Sky movie. Manga creator Suzuki wrote an original story for the 2018 movie The Seven Deadly Sins: Prisoners of the Sky (Gekijoban Nanatsu no Taizai Tenku no Torawarebito). The cast for The Seven Deadly Sins movie is listed as the following. Although it’s uncertain where exactly the movie fits inside the overall timeline, it’s probably safe to assume the story is set in a time gap between major events in the main manga timeline. The movie’s events definitely take place after the third season since Lord Escanor is featured on the movie poster. It’s even possible the movie takes place after The Seven Deadly Sins Season 4. Placing a movie’s story after the events of a future anime adaptation is not unheard of since the Fairy Tail: Dragon Cry movie takes place after some of the events in the upcoming Fairy Tail Season 3. There are multiple new characters who are not in the manga. The character bios from the official website describe Bellion as wielding a sword one-handed. Voiced by Toshiyuki Morikawa, Bellion is the character shown at the top of the movie poster and his hands are reaching toward two new winged characters, Sorada and Ellatte. The male and female Sky Winged Ones are on a quest to protect the Sky Palace against the Demon Clan by seeking out the legendary Lord Oshio. Produced by A-1 Pictures, The Seven Deadly Sins: Prisoners of the Sky movie release date in Japan was August 18, 2018. Netflix eventually released the movie for international streaming with an English dub and other major languages. The Blu-Ray and DVD release date for the film was February 27, 2019. As of the last update, Studio DEEN or any company related to the production of the anime has not officially confirmed the exact Nanatsu no Taizai Season 3 release date. The Seven Deadly Sins Season 4 has been confirmed to be coming out in the time frame of the fall 2019 anime season, which means October 2019. Anime sequels are often held back by two factors: the first is that the anime industry is operating at peak capacity due to staffing issues. That might explain why the anime was handed over to Studio DEEN rather than finish the project with A-1 Pictures. The second issue is that some anime will catch up with the source material. Thankfully, the manga was over Chapter 300 when the Season 4 announcement was made and reach the ending by late 2019, which meant there was more than enough source material for beginning production on The Seven Deadly Sins Season 4 by 2019. The sticky issue is how to handle the manga’s ending. Even though the manga is ending in the same time frame as the fourth season’s release, it’s possible the fourth season won’t be the final season unless certain decisions are made. Since the anime still needs to adapt over 130 chapters, it’s very likely the number of episodes per cour will be increased to at least 13. Unfortunately, even with a combined total of 26 episodes, the pacing for the fourth season would also need to increase to a ratio of 5 chapters per episode. That option would not make manga fans happy with the anime adaptation. The second option would be to slow the pacing down to a 3.5-to-1 ratio, which would allow the anime to finish the story with three cours composed of 12 episodes each. If that’s the plan, then Studio DEEN could conceivably release a single-cour fourth season in 2019 and then end with a two-cour The Seven Deadly Sins Season 5. Based on the fourth season’s title, The Seven Deadly Sins: Wrath Of The Gods, it sounds like Studio DEEN is going with the second option. Without getting into spoilers (see below), the next part of the story starts with a giant flashback that will tell how the Sins came to find themselves in the current situation. Note: This section also contains spoilers related to The Seven Deadly Sins Season 3 Episode 24. Reader caution is advised. The ending of the third season definitely turned things around for the Sins, going from total despair when Meliodas is miraculously revived. 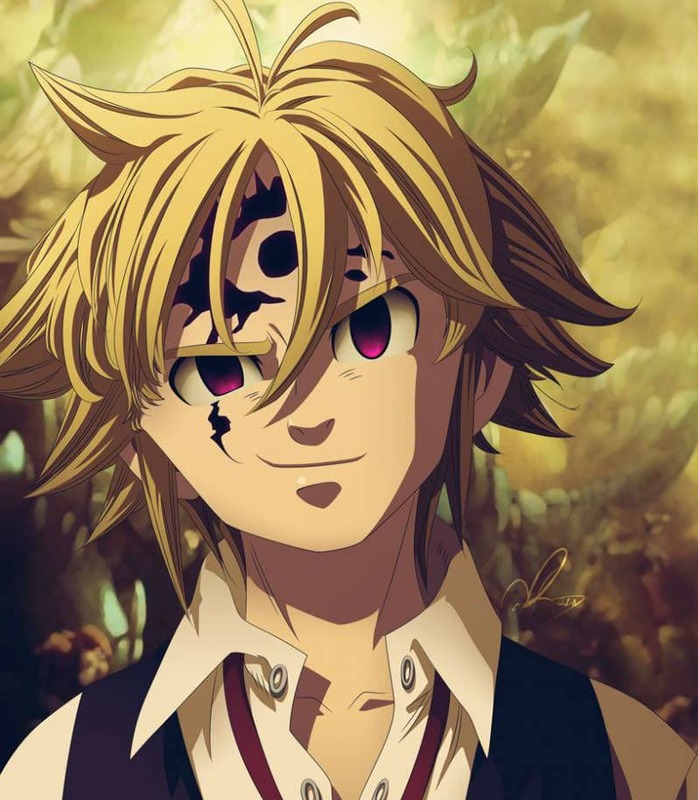 Hope turns to dismay when Merlin, Escanor, and Ban realize Meliodas is now at the pinnacle of his strength, but he’s also reverting to being the pinnacle of evil. Meliodas’ experience in Purgatory has changed his personality so much that even Ban cannot recognize his friend anymore. The newly resurrected Meliodas brutally had killed Fraudrin in such a callous manner that it seems like he’s returned to the mindset of the successor of the Demon King. That’s the power of the curse of immortality bestowed on Meliodas by the Demon King. Each time Meliodas is brought back from the dead more of his humanity is stripped away. Thankfully, the good in Meliodas is not gone and he’s horrified at the thought of turning back into the cruel person he used to be. The good news is that Meliodas’ demonic strength has increased to the point that he can fight Escanor, easily holding his own against the sun-charged powerhouse in Chapter 232. Meliodas’ curse may prevent him from drying, but resurrection comes at a steep cost. But that’s getting way ahead of ourselves. The story of The Seven Deadly Sins Season 4 will open by showing some of the main events of the first Holy War. In order to do that, the manga jumps to a time where other members of the Sins are making discoveries of their own. Far away in the fairy king’s forest, King Harlequin and the giantess Diane still believe Meliodas to be dead. In Chapter 198, they accidentally get naked together in a stream, but by the next chapter, they quickly find themselves in hot water when attacked by Gloxinia and Dolor. It turns out the two Commandments are not really part of the Demon Clan and they once were the King of the Faeries and the King of the Giants. By Chapter 200, Diane and King are transported 3,000 years into the past, where they meet the Meliodas of the distant past. They discover why their predecessors desired to become demons during the time of the first Holy War, but the shocking part is that someone who looks exactly like Elizabeth exists in that time frame and she’s manifested as a Goddess with wings. Diane and King find themselves superpowered in the bodies of Dolor and Gloxinia and they’re able to easily defeat one of the Commandments of old. They are taken to the Stigma Alliance, an organization composed of multiple races with the Goddess Clan at the center. The Goddess version of Elizabeth is hoping to end the war by making peace with the Demon Clan, but then it’s announced that the plan is to exterminate all demons. Worse, the Goddesses are using civilian demons, including family members of the Commandments, as live bait to entrap the Demon Clan. The elite Goddess group the Four Archangels even executes the civilians once the trap is sprung. This is shocking to Diane and King since they hadn’t expected the extinct Goddess Clan to have been so warmongering and cruel in the distant past. When the Four Archangels seemed to be winning the battle, the demons respond by ripping out their own hearts and offering them as sacrifices so they can transform into powerful incarnations of destruction called the Indura. Still, the Archangels are winning and about to kill the demons, so Elizabeth and Meliodas intervene together, trying to save the demons from total annihilation. Needless to say, based on reading Chapter 207 the fight between the Commandments and the Four Archangels will be an epic start to The Seven Deadly Sins Season 4. Audiences will also learn more about the history of the Sins. Back in the present time, Gowther is released from prison, but this version of Gowther has had his memories restored. Gowther of Selflessness was formerly one of the Commandments alongside Meliodas. It’s not revealed until Chapter 211, but Gowther was responsible for erasing Diane’s memories. The “real” Gowther may not look threatening, but even the Demon King respects this magician for his power. Gowther’s history is even more confusing because the Gowther audiences are used to seeing is actually a puppet body controlled remotely by the real Gowther. 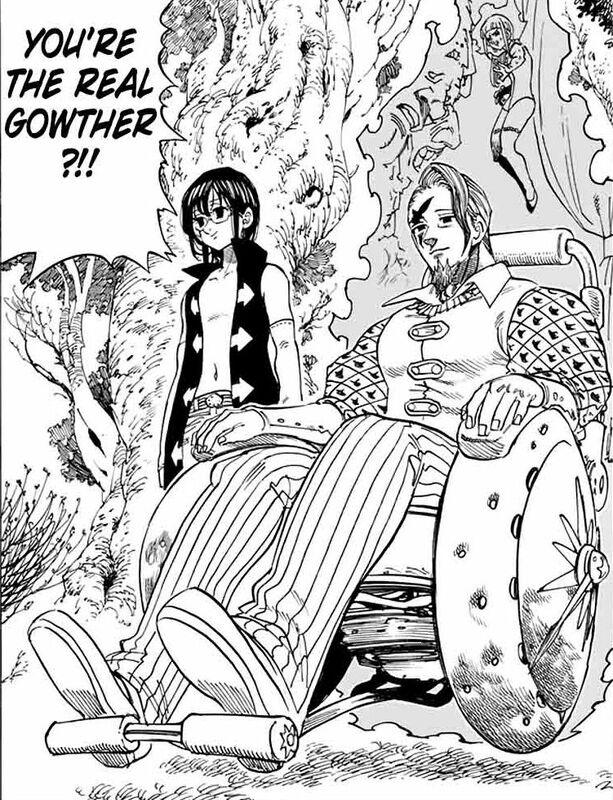 This man in a wheelchair is a powerful demon magician who was imprisoned by the Demon King due to the side effects caused by the Commandment of Selflessness. Planning on ending the Holy War with his death, the “real” Gowther bestows free will on this doll before departing on his mission. Diane and King find themselves making unexpected choices during all of these confrontations. Gowther is not who or what they had expected him to be and even the humans are rebelling against the Stigma Alliance for personal reasons. The giantess and the fairy king eventually find out why Gloxinia and Dolor sided with the demons. Diane’s memories are finally restored and she confesses her love to King. Succeeding in making the right choices (sort of) during this “training,” King and Diane are able to return their spirits to their bodies waiting in the future. Having this experience together drew them closer to each other and they even share a kiss now that Gowther has restored Diane’s memories. King is ecstatic, but even more so when he realizes his back is finally sprouting baby-like fairy wings! By Chapter 217, all seven of the Sins are finally reunited back in Liones kingdom. The Boar Hat pub on Mama Hawk has rebuilt with a new look. Meliodas catches Diane and King up on what’s been happening by saying, “To make a long story short, a bunch of stuff happened and I came back to life.” But this happy reunion is short-lived as events conspire to push the land into chaos once again. 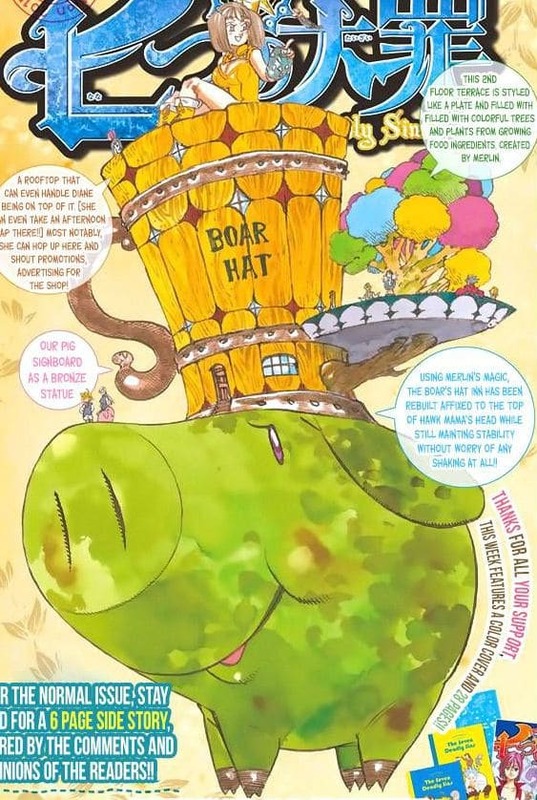 The Boar Hat tavern is renovated and Meliodas and Ban race to claim the best room. Years ago, author Suzuki revealed that he was planning three main story sagas for the manga. Each of these sagas would be divided into smaller story arcs. In a very old interview, the manga creator discussed ending the main manga series by Volume 40, or about Chapter 350. Suzuki has probably has changed those plans, but he also stated multiple times that he wants to create a sequel loosely based on King Arthur myths. The first story saga focused on the Holy Knights and definitely ended with Chapter 100. Unfortunately, it’s not quite as cut and dry when it comes to the second saga about the Ten Commandments. Suzuki has never publicly announced the beginning of the third saga, although it could be argued that Chapter 256 might offer a clear change to the plot. The choices made during the first Holy War have resulted in the current conflict. Peace was only won because the Goddess Clan sacrificed their physical bodies to use the Coffin of Eternal Darkness to seal away the Demon Clan. With the demons having returned and conquered Camelot, the Goddess Clan’s leaders return in Season 4 by possessing human bodies. A new Stigma Alliance composed of the Goddess Clan, Fairy Clan, Giant Clan, and humans is forged in order to start a second Holy War. Assuming that the third saga is named after the New Holy War, the fifth and final season is also likely to be called The Seven Deadly Sins: New Holy War. Not even manga readers know how this story ends yet, so let’s just hope The Seven Deadly Sins Season 4 is not the end of the anime. Stay tuned!